By David L. Barron, J.D. Companies schedule and plan holiday parties with the best of intentions, to reward their employees, boost morale and encourage team spirit. But these gatherings, especially when alcohol is served, can turn into an environment for unwanted sexual advances and potentially illegal employee conduct if the employer is not careful. That is especially the case when the holiday party is held at an offsite location (which, according to the SHRM 2015 survey, is the case in nearly 67 percent of such functions). In a social setting outside of the workplace, an employee whose inhibitions are lowered by alcohol consumption can engage in behavior that he or she would never consider doing on the job. Holiday parties often bring more than just intoxicated high jinks. Being merry can sometimes mean crossing the line, ranging from offending a coworker to violating the law. Moreover, in today’s real-time social media environment, drunken shenanigans at a holiday party can quickly be posted online for the whole world to see. The first two actions an employer needs to take prior to the holiday party include reminding employees that respect and professionalism apply not only on work time but also at company-sponsored events such as office parties. And secondly, employers need to establish social media policies that prohibit employees from posting photographs or video without management permission in social media. These are two good initial steps, but far more needs to be done to deal with the more serious legal issues. The conduct must be sufficiently severe or pervasive. It need not be both. Conduct is not illegal simply because it is inappropriate or makes a coworker feel uncomfortable. However, even a single, extremely serious incident of harassment may be sufficient to constitute a Title VII violation, especially if the harassment is physical. So, if an office party incident follows previous incidents of misconduct, it could constitute the evidence necessary to reach the “severe” or “pervasive” threshold, ​which lays the foundation for a Title VII claim. A second major legal liability is created by drunk driving following an employer-sponsored holiday party. In a 2013 court decision that received substantial publicity, a California appellate court reversed the trial court’s grant of summary judgment for the employer. They found that an employee who consumed alcohol at a company-sponsored event and, after leaving, struck another car and killed the driver created liability for the employer. “It is irrelevant that foreseeable effects of the employee's negligent conduct (here, the car accident) occurred at a time the employee was no longer acting within the scope of his or her employment,” the court ruled. Have in place comprehensive, written anti-harassment policies, clearly stated in employee handbooks—and publicize that policy prior to the holiday party. Send a memo reminding employees to act responsibly at the party, clearly expressing a lack of tolerance for any inappropriate behavior including drunkenness. Enforce the workplace dress code at the party to avoid any inappropriate or suggestive attire and let the employees know your expectations in advance. Make attendance at the party voluntary, and do not suggest that attendance will benefit a person’s standing within the company. If alcohol is served, set a tone of moderation in advance through interoffice memos, emails, meetings, inserts into paychecks or other communications, and stress that excessive alcohol consumption will not be tolerated. Limit the number of drinks or the length of time during which alcohol will be served, and provide substantial non-alcoholic alternatives. Serve plenty of food and ensure that alcohol consumption is not the focus of the event. Such steps are not a guarantee against holiday party problems, particularly if the decision is made to serve alcohol. But they can be an employer’s foundation for an effective defense against liability if problems should come to pass. 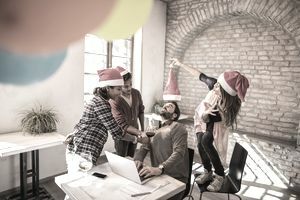 Consider though that ten reasons exist about why employees often loath office holiday parties and take this into consideration as you plan your annual holiday bash.